The 2017 Caminos festival, produced by Aluna Theatre and Native Earth Performing Arts is a week-long festival of new performances centering on Pan-American, Indigenous, and Latinx voices. The festival offers diverse performances in a variety of media, including theatre, dance and music. Opening night on October 4 2017 featured In Sundry Languages and Dividing Lines. I was enamoured of the performance of In Sundry Languages I saw in the Toronto Fringe Festival this summer. The performance in the Caminos festival is significantly different but still highly engaging, and exposes the flexibility and adaptability of the show’s design. In Sundry Languages is a production of Toronto Laboratory Theatre. The performance consists of a series of vignettes, performed in a mix of English and the first languages of the performers. The collective of auditioned artists who flow in and out of the ensemble, bring their own ideas, drawn from personal experience to the piece. The ideas are developed collaboratively with the guidance of a dramaturge using improvisatory techniques. Since the themes of the show include social and cultural divides that are reinforced by different languages, as well as the transcendent nature of non-verbal communication, translation is not provided. The performance asks you to hold space with the discomfort of not always being certain of exactly what is being said to you. For English speakers, it is an exercise in disrupting the privilege of assuming that you can understand and be understood in any context. The miracle of the piece is that even if the specific content is not always clear, the intent and sentiment of each sketch resonates with crystal clarity. I had the opportunity to speak with the artistic director Art Babayants and other collective members at the reception after the performance. They acknowledge that public reception of the work has been mixed and complicated. Some audience members find it excruciating to sit with the discomfort of not being able to understand all of the dialog. That’s part of the point. The show forces you to step inside the experience of someone trying to navigate human interaction without having access to all of the details. When our ability to rely on words to understand is disrupted, we are forced to focus on body language, facial expressions, tone of voice and intuition to find meaning. Given the fluid nature of the collective, the show is ever evolving. For example, the use of live video projection is one of the innovations of the show. In the Fringe performance the live video feed was projected onto a screen off to the side. 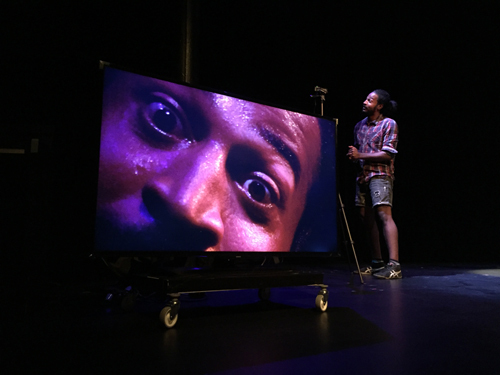 In the Caminos performance, the video stream fed into a TV which took centre stage and became a much more integrated component of some sketches. The second performance of the evening was an autobiographical one-woman show. Beatriz Pizano is a riveting storyteller with a superbly confident command of body language and gesture. Scenes from the author’s life were connected by themes of gender, familial dynamics, migration, and life-transitions. The show fit together smoothly with the first piece because they were united around themes of cultural identity and belonging. This is the second year of this festival and I sincerely hope it continues as an annual event. In addition to theatrical and musical performances, the festival features a nightly, eclectic cabaret showcasing local artistry. Caminos is an excellent, accessible opportunity to experience the contributions of Pan-American, Indigenous and Latinx talent to Toronto’s flourishing art scene. Ticket prices range from $0 – 18 depending on the performance.